I don’t think I need reminding. I totally get that my thoughts, good or bad, affect outcomes in my life on a daily basis. This entry was posted in Uncategorized and tagged Betterment, dinner, Kids, Motherhood, parenthood, sick kids, slow cooker on January 9, 2013 by Nancy. Sometimes life needs a little perspective. I find that this is more true now that I am a mother. Funny enough, it has taken me the last four years to really understand that perspective can be everything. This entry was posted in Uncategorized and tagged children, happiness, kids, Kids, motherhood, Motherhood, parenthood, parenting, sleep on February 12, 2012 by Nancy. This entry was posted in Uncategorized and tagged betterment, Betterment, Blogging, busy, chaos, happiness, inspiration, Motherhood, My thoughts, parenthood, sacrifice, steps to sanity, stressed-out, thankful, time to write, twitter, writing on February 2, 2012 by Nancy. This entry was posted in Uncategorized and tagged family, June Cleaver, Leave It To Beaver, parenthood, reality, The Middle, TV, Uncategorized on January 13, 2012 by Nancy. This entry was posted in Uncategorized and tagged behaviour, best-laid plans, children, discipline, kids, mommy, parental attention, parenthood, parenting, parenting tactics, siblings, teach by example, Uncategorized on December 29, 2011 by Nancy. I was walking back to my car after dropping my daughter off at school when I realized I had something in my hand. 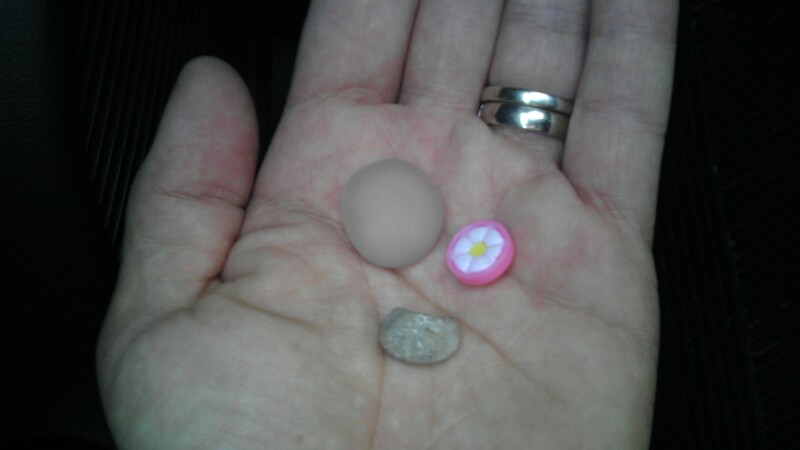 I opened my hand and there, cradled in my palm, was a small pebble, a perfectly formed decor stone, and a little pink and white button. In the rush of getting my daughter into her classroom this morning, she must have put these little treasures in my hand without me realizing it. And now, there they were, to remind me of her as I rushed off to work. It gave me pause (and made me incredibly happy) to see these three little items to which she attached so much importance. I knew I had to keep them safe for her and return them to her when I picked her up from school. Those little treasures, now so important to me, are tiny symbols of the trust she has in me to take care of her and of her things. In our busy life, I often expect her to remind me of things that she needs or wants. I’m trying to teach her to be responsible for herself. I forget that she’s only a little girl and all she needs to be “responsible” for is having fun and learning. As her mom, it’s my job, regardless of how busy I am, to take care of her so that she is free to have fun and to learn. And these little treasures she has entrusted me with, these are little pieces of her that she has given to me to teach me how to better take care of her. She has reached inside my busy mind and given me hope that I can be the mom she needs me to be, even on the days when I am so tired and so busy that I can’t slow down enough to breathe. All I have to do is look at the picture on my phone (which is forever with me even when she can’t be), and be transported to that moment when I saw her message through three tiny treasures. This entry was posted in Uncategorized and tagged chaos, childhood, children, family, happiness, happy, kids, mommy, motherhood, parenthood, parenting, responsibility, special moments, stressed-out, take care, taking care, thankful, treasures, Uncategorized on December 23, 2011 by Nancy.